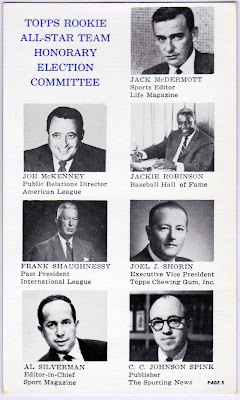 This stately group of gentlemen helped pick Topps All-Star Rookies between 1959 and 1964, usually designated as such on the card itself. 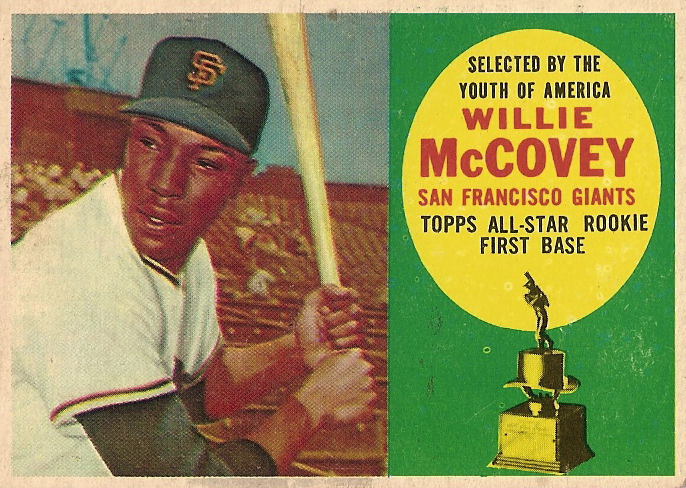 Willie McCovey's rookie card is one of the best. 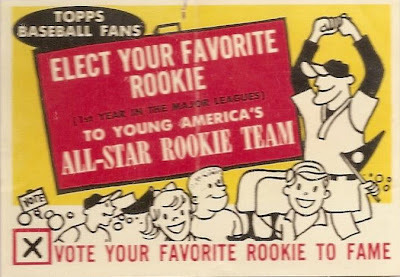 In 1959, collectors could mail in votes for All-Star Rookies, thus the "selected by the youth of America" tagline. 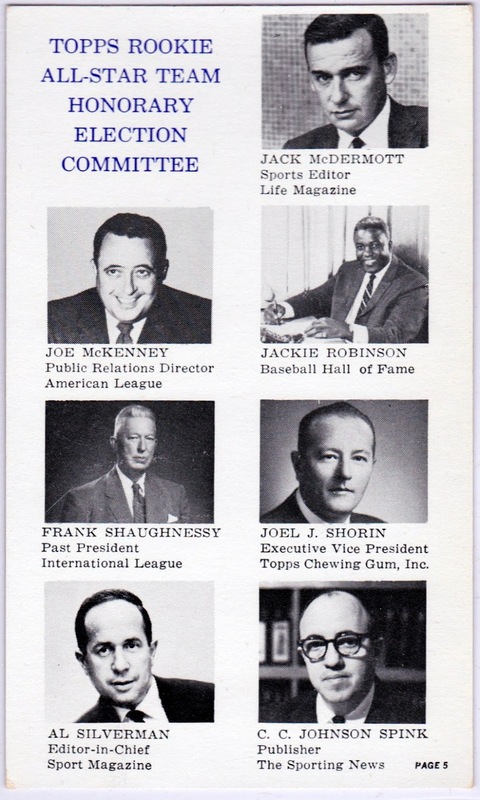 Topps hosted a 1964 banquet in honor of their trophy-winning ballplayers and gave them a commemorative boxed set of 35 cards. Today's #5 includes a "page 5" note at lower-right because their set copied the event's full-sized program design note-for-note. Will only a few hundred attendees, it's no surprise that very few All-Star Rookie boxes reached the 21st-century collectors market. Some singles appear on eBay, but complete sets usually sell at higher-profile auctions. New York uniform trivia #1: Yankee reliever par excellence Mariano Rivera continues to hum along as the last guy to wear All-Star Rookie consultant Jackie Robinson's #42. The MLB retired for his uniform number for all teams in 1997, but allowed active players to continue using it. New York uniform trivia #2: Once New York retires Derek Jeter's #2, the only active number under #11 will be #6, which they've left unissued since Joe Torre's departure in 2007. Jeter might be the last Yankee to wear single-digit pinstripes. New York uniform trivia #3: The Yankees retired #8 for HOF catchers Yogi Berra and Bill Dickey at a shared ceremony on July 22, 1972, one of baseball's few such double-dips. Value: I bought this #5 for $120 on eBay. Since so few exist, the market price varies significantly based on how many collectors go for a given auction or listing.